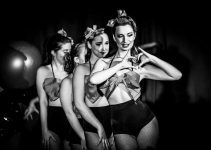 A Burlesque Year 2018 presents a photographic smorgasbord London burlesque highlights. The Burly Photographer’s first annual showcases 50 burlesques, boylesques, drag artists and MCs who delighted UK audiences– from Stockwell to Southend. From feathers and tassels to politics and rugby, it captures the variety of burlesque. 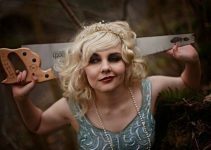 The Burly annual covers leading burlesque producer, Tempest Rose’s astounding shows including: Burlesque Idol, the Spiegeltent, and Vault festival. It also includes exciting highlights at smaller venues like the Albany, Cavendish Arms, Rolling Stock and Central Station. Little Lady Luscious’ brilliant Lush Cabaret, Vicious von Vixen’s crazy Tuesday evening in Kings Cross and the new shows organised by the gorgeous Lady Blue Phoenix in Southend are all featured in this photo-tastic Burly annual. Turn the pages to catch a glimpse of some 2018’s best burlesque competition winners like Burlesque Idol’s Onyx Fatale and the first ever Miss Burlesque UK winner Amber Topaz with runner up Bunni Morreto. The annual also includes marvellous moments from performances by 2017 Burlesque Idol winner Bonnie Knockers, established performers like Lolo Brow, Gracie Disgrace, Trixie Kixx and Australia’s gifts to the UK: Trash Valentine and Valerie Savage plus astounding newcomers like Donna Divine. The book also showcases the producers and MCs including, Paulus, the most photogenic MC on Instagram. Treat yourself to 52 pages of the inspiring style of the London burlesque scene. Printed in full colour with some atmospheric black and white images in the mix, A Burlesque Year costs £24.49 plus p+p in softback and is available from blurb.co.uk.